MASSIVE Fam at the Bowl this Sunday Jan 26 FREE! 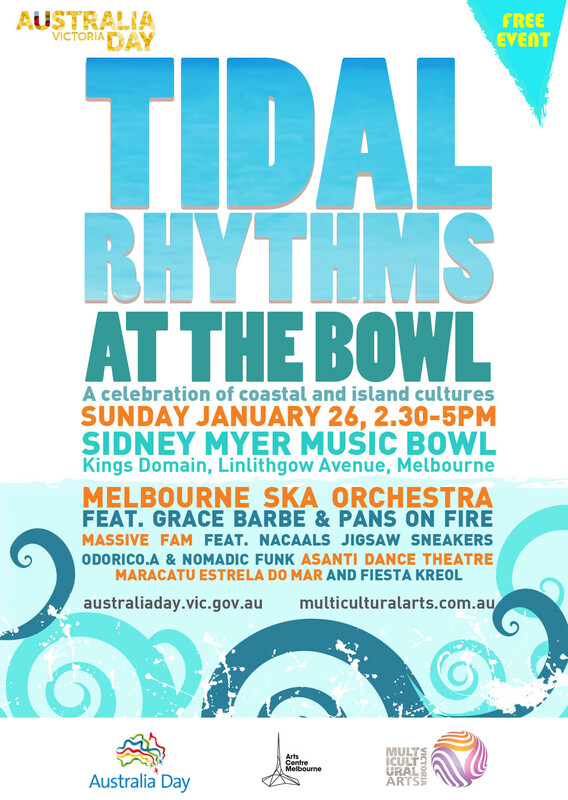 Programmed by Multicultural Arts Victoria, Tidal Rhythms is a celebration of coastal and island cultures featuring Melbourne Ska Orchestra with Grace Barbe and Pans on Fire, Asanti Dance Theatre, Maracatu Estrela Do Mar and Fiesta Kreol. MASSIVE team up with some of Australia’s most fly street dancers;Nacaals, Jigsaw Sneakers and Nomadic Funk. A FREE family friendly all round good vibes extravaganza. Sidney Myer Music Bowl, Kings Domain Linithgow Avenue.